I had a brief Twitter exchange with Roger Pielke Sr. yesterday. I had commented that I thought the AGU position statement on human-induced climate change was very good, and he wanted to know what was wrong with his alternative. Well, I’m not sure how Roger Pielke Sr. can produce an alternative statement. Surely, there can only be one AGU position statement. It seems a bit presumptious for an individual to think that they could produce an alternative. This paper is an important much-needed assessment of the climate system, and illustrates, for example, the inadequacies of using linear trends over multi-decadal time periods, as well as the value of using ocean heat data as the metric to assess global average radiative imbalance. I recommend the entire paper be read. FTOA + FGeo = 0.62 [dOHC/dt]. The 0.62 on the right-hand side is because the rate of change of ocean heat content is normally in units of 1022J/yr, while the TOA and geothermal fluxes are in Wm-2 (i.e., convert 1022J/yr to J/s and then divide by the area of the Earth). They then take the ocean heat content data, which I show in the figure below, and use it to determine dOHC/dt. Figure 1 from Douglass & Knox (2012) showing the ocean heat content data together with their lines used to calculate the gradient (rate of change with time). From the rate of change of ocean heat content, they then use the equation above to determine the TOA flux (FTOA) assuming that Fgeo = 0.087 Wm-2. Their result is shown in the figure below. From this they conclude that there are “climate shifts” where the TOA flux switches from being positive to being negative and then back again sometime later. They are therefore concluding that there are lengthy periods where this is no warming (FTOA negative) and that these are associated with some kind of, as yet unexplained, climate shift. Figure 2 from Douglass & Knox (2012) showing there calculated FTOA. Issues with this paper have already been addressed in a comment by Nuccitelli et al., and you can read more at Skeptical Science. One fairly basic problem is that they only used ocean heat content down to 700m, while we now have data down to 2000m. Including this extra data, changes the result considerably. I, however, have a much more fundamental problem with the paper. This seems to be mentioned in Dana Nuccitelli’s comment paper, but doesn’t seem to be addressed fully (as far as I can tell). Essentially, the fundamental problem is that their assumptions and their equation (that I show above) is wrong. Let me see if I can explain this. FSun + Fgeo = Fout. FTOA = FSun + Fgeo – Fout. If this was positive, then the system would be gaining energy; if negative, the system would be losing energy. Given that the oceans absorb most of any energy excess (at least 90%), then one could estimate the TOA imbalance by using the gradient of the ocean heat content data. However, you don’t subtract the geothermal flux from this gradient (as Douglass & Knox appear to have done) because the geothermal flux is already included in the TOA flux imbalance. 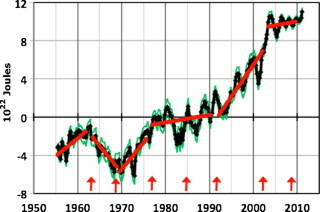 The gradient of the ocean heat content data, alone, is the estimate of the TOA energy imbalance (or about 90% of the imbalance). FTOA = FSun – Fout. In other words, a satellite measurement will underestimate the flux imbalance by an amount equal to the geothermal flux. I don’t know if this is corrected for or not, but the errors in such measurement are quite large and the geothermal flux is quite small, so worrying about it may not really be necessary. So, at best, what Figure 2 from Douglass and Knox is showing is what a satellite would directly measure the TOA flux imbalance to be. It’s not the actual flux imbalance because to get that you need to add back the geothermal flux. Hence, even with only data down to 700m, the TOA flux imbalance would be positive for all times after 1970 (which should be obvious from Figure 1 anyway). If you include (as Nuccitelli et al. correctly suggest) data down to 2000m, it is positive and significant (~0.5 Wm-2). So, why am I writing this? Well, I know Roger Pielke Sr. is a professional climate scientist with a fantastic publication record and lots of experience. How, then, can he think this paper is an important much-needed assessment of the climate system? As far as I can tell, they not only ignore a big chunk of important data, their basic assumption and calculation is simply wrong. There’s a chance that I’ve misunderstood something so, if I have, feel free to tell me what and I’d be happy to be corrected. However, until such time, I certainly won’t be seriously considering an alternative to the AGU position statement from someone who thinks that Douglass & Knox is an important piece of work. This entry was posted in Climate change, Global warming and tagged American Geophysical Union, Climate change, Climate Shifts, Douglass & Knox, Roger Pielke, Roger Pielke Sr, Skeptical Science, Twitter. Bookmark the permalink. Short answer, yes, you are correct. RP Sr has endorsed no end of tripe (see his blog). He has an agenda and – apparently – it has distorted his judgement quite profoundly. I haven’t looked much at his blog, but I do find his endorsement of this paper remarkable. I remember seeing the paper a while back and immediately thinking, surely this is wrong, but not giving it much more thought. I don’t really understand how an experiences scientist cannot see that the calculation in the paper is fundamentally flawed, irrespective of whether or not they used all the possible data when doing the calculation. Eli Rabbett has frequently stated that RP Sr is involved with Anthony Watts and WUWT represents the populist face of RP Sr’s contrarian or dissenting view of the scientific consensus on AGW. RP Sr has certainly endorsed AW in the past, and in particular the Surfacestations.org project. IIRC RP Sr has also co-authored with AW. Yes, that does seem very odd. As much as I’m keen for people to have the freedom to do as they wish, I’m not convinced that people who align themselves with those who support what are demonstrably unscientific arguments should be given much credence. They have the right to do so, we (society) have the right to then ignore them. We’re not doing enough of that in my opinion. There are two Roger Pielke Seniors. The blogger and the scientist. As blogger he plays the climate “sceptic”, palls up with anti-science people such as Anthony Watts and promotes the Watts et al. manuscript as game changing paper, as BBD already pointed out. As a scientist, he has done a lot of good science, especially on regional climate modelling and exchange processes between the land surface and the atmosphere. And as a scientist he writes papers that acknowledge man-made climate change by greenhouse gasses and only points out that the climate system is more complex than that, which I would also do if I would work on exchange processes and would like to get more funding for that. And climate is always more complex, so that is a save claim. I think his social circle would be surprised if they read his papers. The above paper was promoted on his blog. Yes, there’s no question that he has had a remarkable career and must have done some very good work to have the record that he has. I’m just surprised that he would endorse what seems, obviously, a flawed paper. I read his alternative statement and it didn’t really say anything that I specifically disagreed with. It did, as you say, suggest that everything was much more complicated than some think (which it probably is, although we probably understand the fundamentals better than some acknowledge). What I disagreed with the most in his alternative was what appeared to be a suggestion at the end that we just muddle along and work out how to both mitigate and adapt as efficiently as possible. It doesn’t really say anything, other than let’s work it out as we go along and I prefer the stronger statement made in the official AGU one which is that we should reduce CO2 emissions. This seems, to me, like a no brainer. Victor, I don’t think the two Pielke Snr’s are that far apart. The scientific Pielke acknowledges the physics of greenhouse, but insists that regional forcings due to land use change will dominate global forcings from CO2 in their impacts on the climate. I am not sure he has said as much in the scientific papers, but I believe that he thinks the dominance of regional factors is sufficient to call the projections, including temperature projections of AOGCM’s into question. The difference between the formerly blogging Pielke and the scientific Pielke only lies in the fact that the later is more diffident in his views, and (perhaps) unlikely to make strong claims that peer reviewers would actually expect to be justified by his research. It has been my impression that many of his objections are against the idea that global phenomena (increases in long-lived GHGs, for instance) might be more important than the micro to meso-scale effects he has always studied – that somehow small global changes outweigh larger value but smaller scale regional changes. Something in the nature of “It’s not my work, it must be wrong!” In the process, however, he’s pushed a lot of bad science, and made some rather unsupportable and unfair comments against good work, not to mention supporting nonsense such as WUWT. Just my opinion, though. Well, I don’t know an awful lot about him, but if he thinks Douglass & Knox is an important but of work then I’d agree that he’s certainly pushed some bad science. Fall, S., Watts, A., Nielsen‐Gammon, J. Jones, E. Niyogi, D. Christy, J. and Pielke, R.A. Sr., 2011, Analysis of the impacts of station exposure on the U.S. Historical Climatology Network temperatures and temperature trends, Journal of Geophysical Research, 116, D14120, doi: 10.1029/2010JD015146, 2011. Watts, Anthony, Evan Jones, Stephen McIntyre, John R. Christy, [plus additional co-authors that will be named at the time of submission to the journal]. An area and distance weighted analysis of the impacts of station 1 exposure on the U.S. Historical Climatology Network temperatures and 2 temperature trends. To be submitted, 2012. I’m willing to bet that RP Sr is one of the mystery authors because you are all too nice to take my money if I’m wrong. But does anyone actually know yet? The Game Changer™ draft was originally listed by Watts as having numerous co-authors, including some credits to Pielke – Pielke later disavowed involvement in http://pielkeclimatesci.wordpress.com/2012/08/01/my-involvement-with-watts-et-al-2012-and-mcnider-et-al-2012-papers/ after serious issues with TOB corrections (and Watts complete lack of consideration thereof) came to light. Note that over a year later [ http://wattsupwiththat.com/2012/08/02/update-on-watts-et-al-2012/ ] there has been no additional draft or submission as far as can be seen. I believe, quite honestly, that Watts was being quite generous with credit in that draft, but as this was his first potential submission as primary author (second potentially peer-reviewed work) he didn’t realize that all people listed must both contribute and completely agree with the entire work, not just with sections they might have discussed, commented upon, or contributed data to – in other words, over-enthusiasm in the author list. On the other hand, Pielke Sr. is a listed author in Fall et al 2011 [ http://pielkeclimatesci.files.wordpress.com/2011/07/r-367.pdf ], and has been strongly associated with the “surfacestations” project that Watts led, a site whose entire purpose appears to be to cast doubt upon the temperature record. Thanks KR. Links and all. I don’t keep up with the nonsense as thoroughly as I should. To be very specific, I did not play a role in their data analysis [Watts12]. He sent me the near final version of the discussion paper and I recommended added text and references. I am not a co-author on their paper. I am now working with them to provide suggestions as to how to examine the TOB question regarding its effect on the difference in the trends found in Watts et al 2012. The TOB effect could result in a confirmation of the Watts et al conclusion, or a confirmation (from a skeptical source) that siting quality does not matter. In either case, this is still a game changing study. As I said, much tripe-endorsement. Too much. Note that we didn’t focus much on the geothermal flux in our paper because it’s a very small figure. We were trying to focus on the more egregious problems with Douglass & Knox – there were a lot to choose from. The claim that global heat accumulation has slowed, the claim that this means climate sensitivity is low, the whole ‘climate shifts’ nonsense – all of these are bigger problems than the small geothermal flux issue. It really was a pretty terrible paper, and doesn’t reflect well on Pielke Sr. that he effectively endorsed it. I noticed in equation 1 in your paper that you did not include the geothermal flux. The reason I focused on it here was partly because you hadn’t discussed it in detail in your paper and because including it as Douglass & Knox have done just seems wrong (in addition to the issues that you highlight in your paper). As you say, though, a truly terrible paper for many different reasons. Well, Pielke Sr has had a few more of those “game-changing” papers he endorsed, and which were then picked apart by others as nothing but wrong. My own personal evaluation, call it arm-chair psychology, is that Pielke Sr is desperate in finding support for his own hypothesis (warming due primarily to land-use changes). Any paper that provides such support (even if indirectly) is uncritically accepted. Showing Pielke Sr that there are major problems with a paper is extremely difficult because of the above. I don’t think he is even remotely aware of his confirmation bias, as I’ve seen a few embarrassing exchanges where Pielke Sr kept repeating something the other partner(s) in the discussion had long shown wrong. It happened amongst others on Skeptical Science, but I’ve seen an exchange on Klimazwiebel, too (but can’t find it at the moment – there was a Dutch scientist involved who just couldn’t get through). I wish I could take credit for this but I read it in a comment by Logicman on SkS many moons ago. Sums up the whole debate issue in my mind. > Thus the “Game Changing” finding of whether the trends are actually different for well- and poorly-sited locations is tenative until it is shown whether or not TOB alters the conclusions. The issue, however, is not easy to resolve. …Anthony’s weblog is very much factual and is a solid source of climate and weather information. Anthony has also taken the lead in peer reviewed scientific papers. I am proud to be able to have worked with Anthony for several years, and look forward to continuing to do so. Note that despite not using Watts classifications in Menne et al, a NOAA examination of siting quality versus temperature trend indicated no differences driven by siting: http://www.ncdc.noaa.gov/oa/about/response-v2.pdf – and hence Pielkes objections make no difference to the data. What is really pathetic about the Watts/D’Aleo accusations is that they are so easy to disprove. Point a competent programmer/analyst to the NOAA temperature data repository, and he/she should be able to confirm — with just a few days of coding/data-crunching — that removing the high altitude/latitude stations has very little effect on the global-average temperature results. For someone with coding/data-crunching experience, it’s just not a very hard project to tackle. Come to think of it, that might shed some light on what attracts some folks to professional AGW “skepticism” — it provides career opportunities for the incompetent. Don’t forget the “removal of stations” accusation, where Peterson & Vose (1997) had already described the effort undertaken in the mid 1990s to get extra data. That is, the “removal” actually just was extra data added in the mid-1990s. The Douglass and Knox equation is approximately correct. Ignoring other heat reservoirs in the system, the TOA radiative imbalance (W/m^2) plus the energy flux at the ocean floor (W/m^2) is approximately equal to the change in ocean heat content in Joules. So, at best, what Figure 2 from Douglass and Knox is showing is what a satellite would directly measure the TOA flux imbalance to be. It’s not the actual flux imbalance because to get that you need to add back the geothermal flux. Your comment has made me think about this a little more. The change in ocean heat content is essentially the total energy imbalance (Solar + geothermal – outgoing). Technically, the TOA imbalance is simply Solar – outgoing, since it can’t include geothermal input. So I’ve worded my post poorly. I was using TOA in places where I meant total energy imbalance. In my view, the total is what’s important. In equilibrium we should (on average) not have an energy imbalance. That we do indicates that the system is out of equilibrium which, from a global warming perspective, is what’s important. The implication in Douglass & Knox is that there are periods where the energy imbalance is negative, which is not correct as these are periods where the ocean heat content continues to rise. Looking at the Levitus (2012) OHC time series for the 0-2000 integral, there seem to be short annual periods when there is an implied negative TOA radiative imbalance, despite the longer-term imbalance being positive. Note the period 2007-2009 in the Argo data. Of course this likely owes to short-term natural variability (a noisy system), but longer-term oscillations in the tropical Pacific over decadal periods are gaining more attention from mainstream climate scientists. Since the gain of ocean heat from the added GHG forcing largely owes to enhanced downwelling longwave, there are many remaining valid questions about mechanisms which allow the deep ocean heat uptake to outpace the accumulation in the shallow well-mixed portion (over 8 years of reliable Argo measurements). Because of latent and sensible fluxes of heat between ocean and atmosphere, feedbacks come into play which might conceivably affect the longer-term trajectory of the climate system. In other words, the system may have a longer memory of initial conditions than believed a few years ago, when most scientists believed the boundary value problem (ever increasing GHG forcing) swamps the “weather noise”, even over decadal periods. While this still may be true, there are more questions today about the role of natural variability over these periods in light of the “pause”. More mainstream folks are talking today about natural “climate shifts”, so in my view, you should lighten up on the Douglas paper, and also Pielke for recommending that it be read. It may not be robust, but there is really no harm in reading. Maybe I have been a little hard on the paper and on Pielke Snr for recommending it. It’s not so much that he recommended reading it, more that he seemed to think that it was a fundamentally important bit of work. So, yes, no harm in reading it. I do, however, find the paper misleading in that it makes it seems as though there are periods when the energy imbalance was negative. This is wrong for the two reasons we’ve already discussed (they’ve only computed the TOA radiative imbalance and they haven’t used the OHC data down to 2000m). I can’t find anywhere in the paper that clarifies this. I don’t have any fundamental issue with the idea of climate shifts, I just have an issue with the perception that some are suggestion that these could be influencing the long-term global warming trend when there doesn’t really seem to be any evidence to support this view. I can’t quite see what you’re suggesting with regards to the Levitus 2012 data. I can’t see any period where I the TOA radiative imbalance would be negative, but maybe I’m not looking at the right data. wotts, you are being too generous to Kristie’s point, and too generous to Pielke Snr. He not only recommended reading the paper. He also quoted extensively from sections in which conclusions based on flawed analysis were drawn. He did not point out the flaws in analysis, and certainly did not point out how they effect the conclusions (ie, the conclusions do not follow once the flaws are removed). Given the very basic nature of the errors involved, that shows either incompetence or a willful blind eye to known flaws. I’m sure some people find von Daniken an interesting read. Frankly I do not have time to waste on such nonsense, and would think poorly of anybody who recommended it – especially without any caveats about the flawed reasoning and factual inaccuracies. The only reason I do not think less of Pielke Snr for his recommendation of Douglass and Knox is I already know his form. Tom, I think I largely said what you said but maybe not quite a forcefully 🙂 I do tend to agree that it doesn’t reflect well on Pielke Snr and I agree that the conclusions drawn were based on a flawed analysis. It’s certainly a paper that probably shouldn’t have passed peer-review and it is a little amazing that it did so. Having said that, such papers do sometimes get through. You are correct. I should have more closely reviewed Levitus 2012 before writing. Indeed in the Argo-vintage time series, Levitus does not report a single yearly average where there is net loss of heat from the 0-2000 integral. Of course in the pre-Argo data, there are less-reliable multi-year periods where relatively significant losses of heat are still implied (although these have become smaller with subsequent revisions), suggesting natural variability is important, at least over yearly to decadal periods. 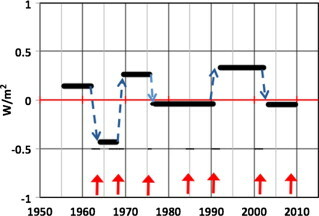 As the GHG forcing continues to increase in the future, longer-term natural variability (weather noise) is expected to become “swamped” with the signal from the constantly increasing net forcing change associated with GHGs, although it has certainly come to light in recent research that natural variability associated with deep ocean mixing may significantly affect *transient sensitivity*. In my view, this does not seem controversial in the main-stream literature. What is more debated is whether shorter-term (annual to decadal) “transient sensitivity” is related to very long-term sensitivity” (centuries or longer). Most climate scientists still hold the hypothesis that there is a relatively asscertaiable cone of long-term transient sensitivity associated with a doubling of pre-industrial CO2. Viewing climate change as exclusively a *boundary values problem* leads to this view. This is a hypothesis which is well-observed in climate models, and has a sound mathematical basis. My own observation of the field however, is that a growing number of researchers are beginning to question whether the system retains a much longer memory of initial conditions, so that even the long-term climate sensitivity is sensitive to a mixture of both boundary values (GHG forcing changes) and initial conditions (in both the atmosphere and ocean). As a thought experiment to help illustrate, suppose a significant multi-year period of turbulent deep-ocean mixing delays the surface warming for several years. Owing to the effect this has on latent and sensible heat fluxes (affecting things like water vapor content and maybe clouds), it seems likely to affect the trajectory of surface warming and thus further downwelling longwave into the ocean, ultimately perturbing the entire radiative balance of the system in future years. With seemingly equal probability, it could also go the other way around, where less deep ocean mixing perturbs the system to warm faster, driving a positive feedback and more warming. However, without the ability to accurately model decadal ocean circulation regimes, it might be difficult to bracket within a reasonable band of uncertainty the trajectory of the global warming (in the ocean and at the surface) to be experienced over the next century or longer. In multi–model comparisons, or even single model ensemble means of multiple runs, a poor representation of actual oceanic circulation(acting on a different time-scale than atmospheric circulation) will “wash out” potentially important natural variability, causing the battery of GCMs (and even individual models with poorly resolved ocean circulation) to be dominated mainly by the greenhouse gas forcing. In this way, a multi-model ensemble mean (from those with a dynamic ocean) perform no better than an ensemble mean generated from a battery of models with a swamp ocean. While my view is not yet held by a large number of mainstream modelers, it seems the climate science community is beginning to move in this direction. This is one reason I have personally formed a tentative opinion (after about 10 years of reading the literature from the perspective of a working scientist in another geophysics dicipline) that while the earth will almost certainly continue warming significantly due to the human forcing, the role of natural variability in either dampening or enhancing the human effect over the next couple of centuries will be quite difficult to model with high skill until we gain a much better numerical handle on “the weather in the ocean” . Policy is another matter. Governments are challenged to form policy in the face of uncertainty. For whatever reason, I tend to instictively throw in with folks like Curry and Pielke (but not many of the other uneducated fruits masquerading as scientists in the “citizen scientist movement) in trying to stress to policy makers that the level of certainty about the amount of future warming remains less constrained than some in the climate science community (possibly because of normative policy preferences in the face of a Western democracy) would like the unknowlegeable, unscientific public to realize. I know my views will probably not go over well with many of the readers here, but may I say that I respect yor viewpoint, and appreciate the opportunity to exchange views in a polite and courteous forum. This is a very tough problem, since it combines a very hard physics problem with a very difficult social science issue. Swirled together, we have a real intellectual challenge as a society. P.S. my wife and I are a tag team on this subject. Kristie (my wife) started this discussion above, but she brought me in also, so we both get credit for the comments. The last (too long) comment is largely mine( Bryan), as we do not completely agree with all the nuances of the issues (mostly the differences are not on the science). She is usually right!! Thanks for the comment. You’ve probably strayed into areas that I’m not terribly familiar with. If I understand what you’re suggesting, it doesn’t seem unreasonable. It is possible that what we undergo might depend on the state we’re in when the process starts (initial value problem). Having said that, my understanding from paleo-reconstructions is that there might be some variability in climate sensitivity but not to the extent that a doubling of CO2 could produce less than (for example) 1.5 degrees of warming. In a sense, the hiatus seems to indicate that we can have periods where the warming is slower than expected, but there is no real expectation that the long-term trend will be different to that expected (the timescale may be different though). As far as policy goes, I don’t particularly like what I see coming from Pielke and Curry. To me they over-estimate the uncertainty and seem too closely aligned with some of the rather extreme pseudo-skeptic blogs (WUWT for example). An issue I have is that we don’t seem to have separated the discussions about the science with discussions about policy. Ideally, IMO, we should accept the science (with it’s uncertainties) and then consider what to do given the scientific evidence (with it’s uncertainties). One reason I think that we often confuse the science with the policy (for example Andrew Neil interviewing Ed Davey and confronting him with surface temperature profiles) is that if we did separate it properly, it would be clearer that the scientific evidence is quite strong and the argument for doing nothing would be weakened. Something I do find confusing about this whole discussion is that noone (as far as I’m aware) is suggesting that we should instantly change to a carbon free economy. People are arguing for technology development and a gradual (decades long) attempt to move towards reducing carbon emissions. Even if one doesn’t see the necessity from an environmental perspective, technology development would seem like a useful thing to do anyway. Create jobs. Create new technologies that we didn’t have before. Of course, it will require investment but I suspect to the man in the street, this would be quite an attractive option. Being ahead of the game would also be important. The longer we wait the harder it will be for us to catch up with those who started earlier. “I don’t particularly like what I see coming from Pielke and Curry”. I think we must civily agree to disagree on this point, as I tend to view the role they (and other published scientists who are stressing the remaining uncertainties) are playing as quite healthy and informative. My wife tends to agree with that, although she and I differ on just what can and ought to be done politically. On the actual state of the current science, we do not find much dissagreement. If we cut through the policy discussion, the actual science views of credentialed scientists like Pielke and Curry differ *very little* from the “mainstream view”. Their main divergence with the larger community is in their opinion of the implications that the remaining uncertainties (which they stress) should have on large forward policy decisions, and the process which leads to these decisions in a democratic society. I am afraid that some who disagree with their divergent policy approach seek to cast them as “fools” by framing their scientific arguments out of context in ways that make them look incompetant as scientists. This is dissapointing and a disservice to the free exchange of viewpoints in a civil society. Yes, I have no issue with agreeing to disagree. I guess one could accept that there is agreement about the science and yet disagreement about what to do. Deciding what to do is non-trivial and there isn’t necessarily only one solution. I am, however, fairly new to the details of this whole field and looking from the outside I’m sometimes very surprised by what I read from Judith Curry. As a simple example, she had her “mind blown” by the recent Kosaka and Xie paper which suggested that the “hiatus” was a consequence of cool surface waters in the tropical Pacific. The implication was that this was an indication that natural variability was playing a more important role than others had indicated. My reading of the papers and comments by the authors themselves, lead me to a very different interpretation. The Kosaka and Xie paper was really saying what many have been suggesting. That wind-driven ocean circularization was driving heat into the deep oceans and reducing the heating of the land and atmosphere. This would likely reverse once the surface waters had warmed and surface heating would continue. So, to me that was an opportunity for Judith Curry to acknowledge some of the ideas coming out of mainstream science but instead she seemed to use it to promote that natural variability was playing a more important role than others would accept. Of course, it seems clear that it is playing an important role in surface warming, but not really playing a particularly big role in overall warming. It’s the confusion between surface warming and overall warming that seems to be one of the major issues in this whole debate. Clarifying the difference would be a very big step forward and one that Judith Curry could have done, but somehow seemed to choose not to do so. To be fair, I’m not really trying to pick on Judith Curry, just giving my impression from what I’ve seen of her writings. I just sometimes get the impression that she doesn’t understand some of this as well as one might expect. Admittedly, I’m no expert in this field so maybe I’m the one who is mistaken. Bryan, I don’t know about “incompetent as scientists” but both Pielkes (Snr and Jnr) and Currie show a clear disinterest in correcting their work for obvious errors. Further, Curry in particular has a tendency to go “wow, this is interesting and important” about clearly incompetent science that runs against the IPCC consensus. As she does this on her blog rather than in scientific papers, it could be argued that that should not detract from her scientific reputation, but I would very much argue the opposite. Pielke Snr also has a strong tendency this way, if not quite so effusive. As evidence, consider his praise of Douglass and Knox, and his praise of the WUWT blog as being sound scientifically. More directly to the point, their treatment of uncertainty is neither sophisticated nor sound. In particular, Curry’s “Italian flag model” is simply laughable. More troubling is that they both assume that uncertainty is our friend. It is not. One thing that is fairly clear is that in the past, large changes in GMST have been accompanied by mass extinctions. That means the Earth’s biological carrying capacity has dropped significantly at every such event. The drop in carrying capacity is the consequence, not the cause of the mass extinctions. It occurs because with fewer species, ecological niches are occupied by generalists rather than specialists, with a consequent loss of efficiency in turning negentropy from the Sun into biological mass. So, the biggest uncertainty about climate change is, what is the probability that the Earth will be pushed to a point where there is a significant drop in the biological matter it can support. For biological matter, read human lives as we are now by far the most prevalent species in numbers and mass at the top of food chains. So, we accept that this outcome (ie, the drop of human population by factors of two or more) is uncertain. But the negative utility of any such event far outstrips any conceivable loss of utility from cessation of using fossil fuels. Therefore the uncertain possibility of such an event will dominate any rational policy considerations. In contrast, Curry and the Pielkes treat only uncertainties towards more beneficial outcomes as significant. The talk up the uncertainty such that ECS may be 1.5 C per doubling of CO2 rather than 3 C, but ignore the fact that it may be 4.5 C and that the consequences in negative utility of the difference between 3 and 4.5 C ECS are far greater the positive utility of the difference between 3 and 1.5 C.
FWIW, my mind was “blown” too. Until only a few years ago, the deep ocean was almost universally ignored when discussing significant ocean heat uptake over time scales usually concerned with in modern climate change. It was assumed that its role was very likely negligible. Over the last few years, as it has become more apparent that the 0-700 integral seemed to be warming much more slowly than projected (from the calculated net radiative forcing + feedbacks), researchers began deliberately looking for this “missing heat”, and the only place to look was in the deep ocean. After a significant effort to correct for systematic errors in both the measurements and calculation methodology, the Argo record currently seems to indicate that the deep ocean (700-2000 meter volume integral) has been gaining heat significantly faster than the shallower ocean (0-700 integral), and during the last eight years has stored around 0.62 of the total net radiative imbalance inferred over this period (please download NODC OHC data to confirm). Considering the limited and well-understood mechanisms by which the ocean gains and loses net heat from radiative forcing changes (mainly due to enhanced downwelling longwave and reduced evaporative heat losses taking place near the ocean/atmosphere interface), the new finding indeed constitutes a remarkable result which should be very heavily scrutinized by as many qualified researchers as possible. Indeed, I agree. It is remarkable and should be scrutinised fully and thoroughly. My interpretation (and I’d be interested in your views) is that it illustrates (unless there is a major issue with the data) that our understanding of the fundamentals of AGW is robust. However, how the excess energy is distributed through the climate system is more complex than maybe realised a few decades ago (although I was reading some of the AR2 report today and it does seem that it was recognised even then that the oceans would play an important role in distributing energy through the climate system). The implications of this, as far as I can tell, is that the TCR may be lower than previously thought but that the ECS is likely to be unchanged. Also, the time to reach equilibrium may be longer than would have been predicted a decade ago, but not by more than about a factor of 2. So, maybe we have more time, but the ultimate outcome is probably unchanged. Bryan S, on the contrary. It has been a feature of climate science since the 1990s at least that the rate of sequestration of heat into the ocean controlled the rate at which the planet’s surface approached equilibrium to a new radiative forcing, and hence the ratio between the Transient Climate Response and the (Charney) Equilibrium Climate Response. The greater the rate of sequestration, the greater the ECR relative to the TCR. That is the reason computer modelers of the climate have complicated their models by going from “swamp ocean” models to full coupled Ocean-Atmosphere General Circulation Models, and included a term for heat transfer to the deep ocean as well. That is also why a very substantial investment was made for the deployment of deployment of ARGO by 2004, long before the so-called “hiatus” became the cause celebre of all but a few deniers. It was also why Gregory et al (2002) made an observational estimate of the ECS based on OHC before the “hiatus” was even imagined by deniers. What has changed in recent years is that OHC has become much more discussed – in part as a response to the misinterpretation of the effect of the 1997/98 El Nino and the 2008 La Nina on the recent superficial temperature trend. In my view it has been over emphasized, but that does not mean it is a novel ad hoc addition to the theory of climate change.